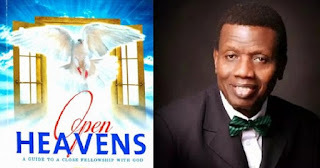 Open Heaven [4 May 2018] When You Need Revival - Open Heavens Daily Devotional Messages, By Pastor E.A Adeboye. 1 And the children of Israel did evil in the sight of the Lord: and the Lorddelivered them into the hand of Midian seven years. From God’s perspective, revival is a state of restoration of spiritual interest which has suffered setback or has been abandoned by God’s people. It connotes renewal or the return to original status from a state of coma or disuse. Based on the use of this term in some portions of Scripture, it is evident that it also means to literally bring back to life from the dead (1st Kings 17:22, 2nd Kings 13:21). I therefore speak the word of authority to everything that is in a state of coma, and everything that is partially or completely dead in your life: receive complete revival by the power of resurrection in Jesus’ Name. In Revelation chapter 2 and 3, the description of the spiritual state of most of the seven churches in Asia is indicative of spiritual conditions that call for revival. May the Good Lord heal and completely revive everyone reading this that may be in a backslidden state in Jesus’ Name. The backsliding of a Christian does not just happen in one day. Rather, it is a gradual process that involves progressive character erosion. The end result is what people see, and then they begin to ask, when did this fellow become like this? This will not be your story in Jesus’ Name. For that not to be your story, you need to be familiar with and sensitive to the conditions and circumstances that call for revival, in order to kick-start one whenever necessary. There are many overt signs that make revival necessary in a person’s life. A child of God needs revival whenever he or she begins to experience spiritual dryness. Whenever a child of God finds himself or herself in physical or spiritual servitude, as it happened to the Israelites in Judges 3:12-14, It is time for revival. When sinful acts and wickedness such as those recorded in 2nd Timothy 3:1-5 become part of the daily lifestyle of a Christian, he or she urgently needs revival. Whenever you discover that you have lost your peace, joy and divine provision, just as it happened to the Israelites in today’s Bible reading, revival is desperately needed. Also, whenever a child of God falls into a state of self-doubt or uncertainty and he or she begins to feel insecure, as seen in Numbers 13:26-33, this is an obvious sign that revival is needed. Revival is always preceded by sober reflection and a repentant heart, followed by earnest prayers to God for revival. Do you need revival today? Reach out to God, and He will send His fresh fire into your heart. Father, please revive a desire for righteousness and heal every form of regression in Your Church today in Jesus’ Name.